Hog roast is the ultimate solution for any event that you, a friend or a family member may be planning. It is quite simply one the tastiest and most affordable quality catering solutions available anywhere in the UK today. I should know, as I have been ensuring that the people of Swaffham have been able to choose the great taste of a Taste the Cracklin hog roast as their catering solution of choice for nearly five years now, and it seems that they love hog roast as much as anyone. It may sound like a bit of a strange career choice becoming a Taste the Cracklin hog roast caterer and it is certainly not what I wanted to do when I left university but sometimes things take you by surprise, a bit like I was taken by surprise at how amazing it tasted. It was in my second year at University that I first got to try hog roast. It was at the new term freshers’ party to which I had been invited. After the first bite, I just knew that this was pure food heaven and that I simply had to have it again. There were a few hog roast events at university and I made every effort to attend them all. Certainly made a change from tins of baked beans! I made the move into being a caterer at the start of the recession as that was when the construction and engineering sector was suffering. No room for a fresh faced graduate like me, so I looked around and made the decision to get catering in my home county of Norfolk and I have loved every minute of it. What really makes cooking hog roast for people, so special is that it is so rewarding. People really do adore the fact that it is a proper meal that takes some serious hard work to cook properly. I know that we are in a market town in Swaffham and that means that people are well aware of what good cooking is all about so you can’t cook up any old rubbish or you’ll be chased out of town. Well, that’s never been an issue with my hog roast in fact it has helped me secure more and more business every month because talk about how tasty and wholesome my Taste the Cracklin catering service is, is of course really nice of people. I have served up hog roast at many pubs in and around the area and this is something that always goes down really well. I am a big real ale fan so I know just how brilliantly hog roast and a good real ale go together. It is a marriage made in heaven believe me. What does surprise me though is the increasing number of big corporate events I am being asked to cater for. Well, I say surprised…but I am not anymore. I have heard some horror stories about some of the terrible food that some people try to serve up at these events. Lukewarm tasteless efforts that probably cost a few pence to make. 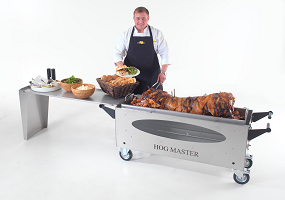 I remember my first corporate event when all the guests started to arrive and they saw me with my huge hog roast machine. He came to me again later, a little worse for wear and said that he was so impressed that he wanted me to cook for his daughter’s wedding in five months time. I thought he’d forget but he didn’t and it was a fantastic occasion. Everyone loved the food and it proved to be the first of many weddings that I have since gone on to do. Weddings are hard work and it needs a bit of extra preparation but I love them. People love the fact that they are not having a turkey or beef meal for a change. I never thought that being a Taste the Cracklin caterer would prove to be anything like as rewarding as it has been, but what makes it so special is the fact that my clients always love the food so much. I must have catered at hundreds of weddings, christenings, birthdays, silver weddings, music festivals and pub nights and I simply could not guess at how many hog roast rolls I have served but I know that every single person has loved their food.